CM: The Entrappped of Maria Kyprianou presents Cyprus personified in a state of regret for its part under illegal occupation by Turkey since 1974. 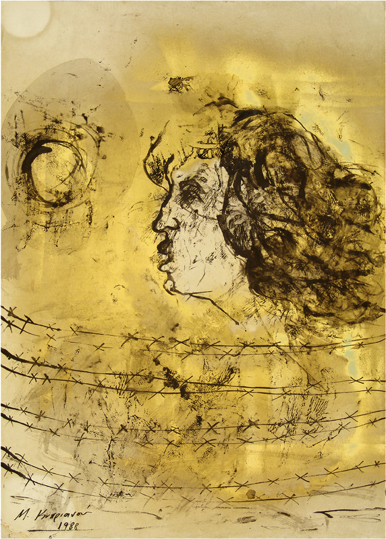 In the center of the work is presented the face of Cyprus in profile (a resemblance of the artist's likeness), which is entrapped behind barbed wire in the island's free side. Cyprus turns her eyes towards the sun, which represents optimism. The golden background derives from the sun and reflects the deep hope of the Cypriots to witness again freedom for their entire country. The projection of Cyprus over the barrier evokes her free soul, which makes her rise against injustice. The seashell in the place of the ear refers to the sea of the island, a great part of which is also under occupation. In keeping with the well-known romantic gesture, the seashell continuously whistles in the ear of Cyprus the need for liberty. The moon that emerges over the sun refers to the continuous struggle for freedom. The Entrappped is a work that combines expressionist and surrealist styles. Kyprianou presents an existential manner of brushstrokes and emotive compositional solutions. The work is replete of pressed paint that references the wood cut technique, which - for its relevance to pathos - underlines the work's psychographical charge.